This weekend was a lot of fun. My son was so thrilled to have his 6th birthday in a sweet shop! You should have heard the gasps of excitement as we entered the shop, he had a look around and proclaimed that he wanted to move in. I don't have much of a sweet tooth but I wanted to move in as well. Nostalgia for the parents, fun for the kids and everyone took lots of sweeties home! They decorated chocolate bars, played fun traditional party games (musical statues etc) and follow the leader running around the shop! Despite that sounding like it would be total chaos, it wasn't. The party was so well organised, nicely timed and it really is the best sweet shop I've ever been to. 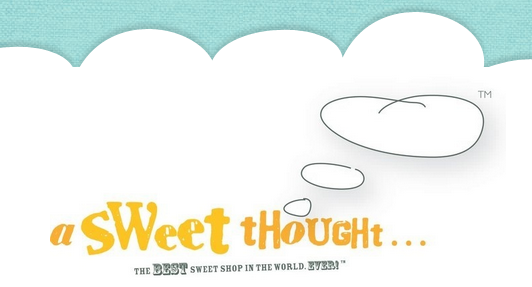 A Sweet Thought have shops in Bramhall and Didsbury and I honestly couldn't recommend it more as a party location and even just for a visit to stock up on goodies! It was brilliant. I made sure to get some of my favourite rhubarb and custard sweets and they are delicious. I'm fairly sure the grown ups bought more sweets than the kids took home and we've all been impressed by the quality. Well worth a visit if you get a chance. Obviously the best bit was my very happy kiddos! He was in really good spirits but we could tell he wasn't quite himself... that made sense when he woke up this morning covered in spots of the chickenpox variety. So he'll be off school for a couple of days at least. Thankfully the other kids at the party have all had it already and I'm just hoping the girls don't catch it! Normal sewing posts will resume shortly, though I've got my hands full at the moment. You can really feel his excitement in that first photo. What a great place for a party! Awesome and Total Bummer! Hope he gets well soon! Sounds like a real nice time. Years ago, one of my kids had chicken pox and her brother never got them--ever. All five kids but not him. Hope he doesn't get them now! Just don't let him pick the spots! I still have scars from messing with mine. Party sounds like bliss, the pox, not so much. Hope it's a mild dose. A great idea Lu! Thye look super excited! happy birthday Fred! This is a fantastic idea for a party!! I would what kind of a party we could have in a quilting shop! Well now he knows what happens if he eats too many sweets! Oh man, I want my party there! Hopefully the pox flies round quickly! That looks AWESOME! I'd absolutely love that. That sounds like the most perfect party! I want my next birthday there! Wow - I wish I were 6 again AND that I lived at your place! I haven't heard of birthdayparties in candystores here i Sweden, but maybe when my granddaugther turns 6 there will be - she is only 17 months so there is lot of times for someone to take the idea to Sweden! And what luck that your son didn't turn ill until after the party! Hope he gets well soon! When I see fabrics all lined up on a shelf...tons of colors... It always makes me think of the rows and rows of candy in clear glass jars that lined the walls at Knotts Berry Farm General Store in CA. I kind of grew up there at the General Store. And then the M&M store in Las Vegas..just color all over the place!